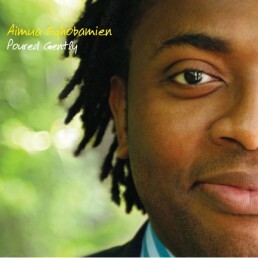 Poured Gently—the debut album of Aimua Eghobamien—combines fresh and unusual arrangements of jazz and pop standards from Ellington, Monk, Gershwin, Stevie Wonder and Bon Jovi with haunting and melodic original compositions and thoughtful lyrics. In collaboration with New York-based pianist, composer and arranger Glafkos Kontemeniotis, Eghobamien ensures that Poured Gently produces a concept that sets a definite mood, entertains and quietly tells a story. Recorded and mixed at Avatar Studios in New York and at Strongroom and AIR Studios in London by Grammy Award-winning engineer Steve Orchard, Poured Gently features the internationally known and highly regarded percussionist Bashiri Johnson and stellar musicians bassist Ed Kollar and drummer Scott Neumann. He teamed up with pop music video director Nick Bartleet to produce a unique music video for the track ‘Tis What It Is.